Adidas has been started to make a name for themselves in the metal bat market. 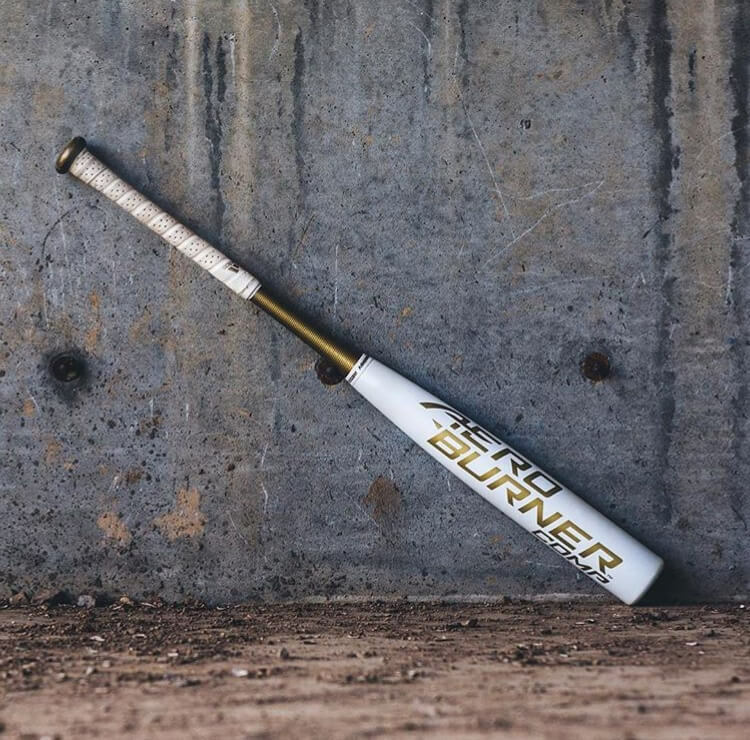 The 2018 Aeroburner Comp BBCOR is a two piece composite bat that features a low swing weight. While we technically tested the 2017 model, the 2018 gold version (only available on JustBats.com) is exactly the same bat with a different paint job. The Aeroburner Comp has a simple, yet effective look. The entire bat is matte white and features a slightly raised honeycomb pattern throughout the barrel. The red barrel ring and the red lettering on the barrel adds a nice touch. The endcap is chrome red and might be the coolest one out there. The 2018 version (again, structurally the same bat) features essentially the same graphic layout in gold. The only difference in layout is a gold streak in the barrel and a gold handle with a black honeycomb pattern (rather than plain matte white found on the 2017). While the 2018 version is a little flashier, the looks work on both bats. The Aeroburner Comp has a traditional knob that is on the thinner side. The handle runs straight into the knob without any taper. The grip is softer than most and provides a variety of grip points with a pattern of indented circles. It’s a high quality stock grip that looks and feels great. The only downside of the grip is that it’s going to get dirty very quickly since it is completely white. As a hitter who likes flared knobs, I wasn’t really a fan of the traditional style knob. If you don’t choke up at all, the knob is going to rub against your bottom hand a lot. The Aeroburner Comp is a balanced bat that will feel very comfortable in the hands of most hitters. While the swing weight is low, it isn’t the lightest out there. When compared to the Rawlings Quatro and Demarini CF Zen (both balanced two-piece composites in the same price range), it feels a tick heavier. The barrel is the second longest of the bats tested, and is complemented by a gradual taper into the handle. 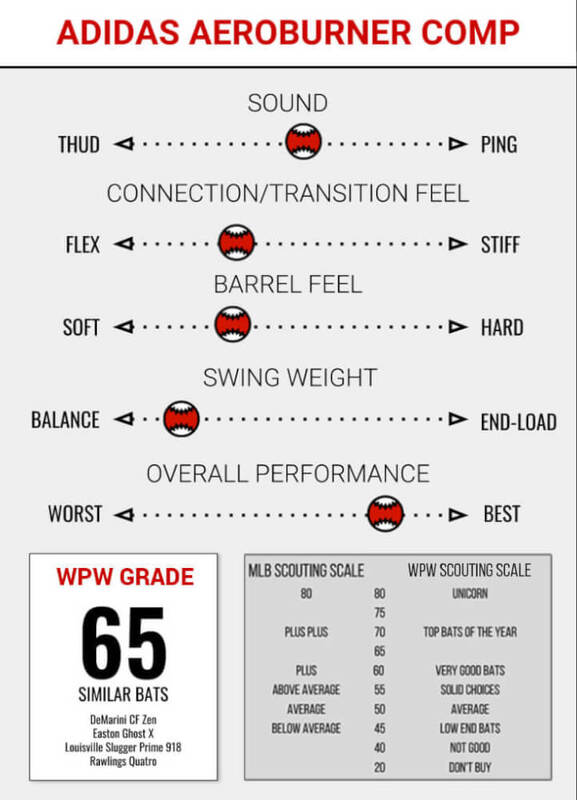 This provides a large hitting surface with plenty of room for error. If you end up getting jammed a little bit, you’re still going to be able to put some barrel mass behind the ball. Overall, the Aeroburner Comp is a well designed bat that feels great in your hands. The Aeroburner Comp performed excellently in the cage. Even though it is a two-piece composite that needs to be broken in, the ball was still flying off of the barrel. It had a stiffer feel, which isn’t common in a two-piece composite. This stiffness will lessen as the composite breaks in, but will still be noticeably different than some of its two-piece competitors that put an emphasis on flex. It has great balance and still provides a large hitting surface with its extended barrel. The bat did a great job of killing vibration to the hands on balls that made contact off the barrel. In terms of sound, the bat made a tolerable ping upon contact that faded pretty quickly. We were pleasantly surprised with the Aeroburner Comp. The bat is simple but effective and can play ball with any other high end two-piece composite out there. Keep an eye on Adidas, it looks like they’re beginning to take their bats seriously.